The Fossil Q is a little over a year old at this point, and is notable for being the first Android Wear watch from a well-known mechanical watch maker. It features a 360x326 round display (unfortunately with a flat tire), an Intel Atom CPU, IP67 water protection, and a 400mAh battery. 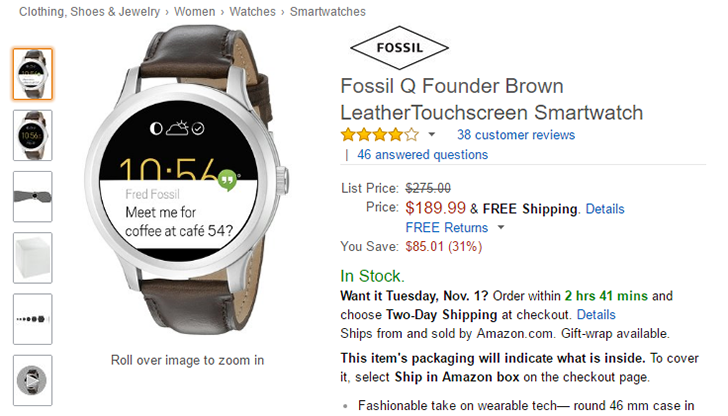 Now you can snag a Fossil Q Founder for $189.99 on Amazon, a decent drop from the $275 MSRP. Not a bad deal, although I'm not sure if I would get it over the Huawei Watch with its frequent price drops. Still, if you're looking for a shiny new Android Wear device from an actual watch company, this is a good option. I recommend reading our extensive review of the Q Founder if you're planning on buying.